MICRALOX is a patent-pending partially micro-crystalline aluminum oxide coating that outperforms conventional anodic coating processes for aluminum. Opposed to conventional anodized aluminum oxide coatings (in an amorphous form, where molecules are in a random arrangement), micro-crystalline aluminum oxide molecules are packed in a regularly ordered, repeating pattern, resulting in a thermodynamically stable, lower soluble form. As noted in the table below, conventional strategies of aluminum anodic coating resulted in limited success in attaining a high degree of aluminum corrosion resistance. Hydro-thermal seals result in poor chemical stability. Precipitating seals exhibit a limited reduction in porosity; they also offered a superior but not ideal chemical stability, with the best performance being achieved with heavy metals. Finally, encapsulation performance is moderated by delamination, poor tolerances and contamination. MICRALOX® micro-crystalline aluminum oxide coating molecules are packed in a regularly ordered, repeating pattern, which results in a thermodynamically stable platform, exhibiting lower solubility. In other words, micro-crystalline structures solubilize (dissolve) at a significantly lower rate than other conventional aluminum coatings. On the left, a sample of aluminum coated with MICRALOX that has been through a 12.5 pH cleaning and sterilization process 10 times. 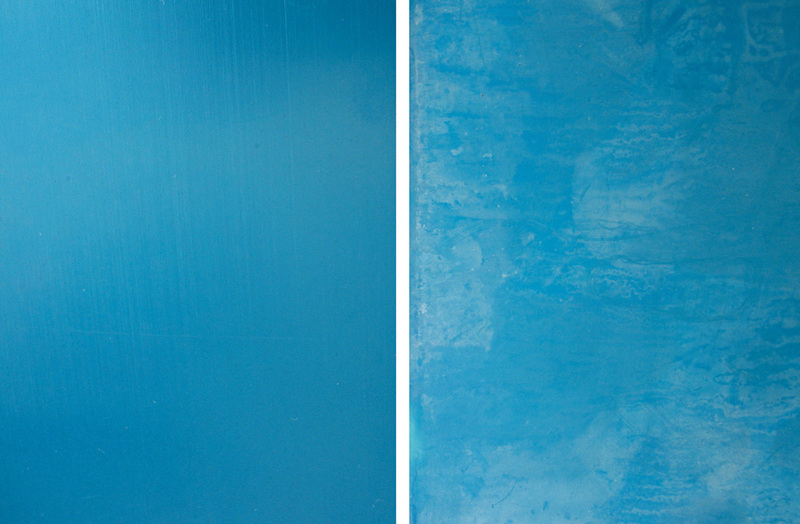 On the right, a sample of anodized aluminum that has been through a 12.5 pH cleaning and sterilization process 10 times. The table below compares the various characteristics of conventional anodic coating and MICRALOX micro-crystalline aluminum oxide coating. Other benefits of MICRALOX® include excellent steam resistance, outstanding dielectric properties, strict and consistent adherence to tight tolerances, and full RoHS compliance. Unlike conventionally dyed aluminum parts and forms, where the dye is susceptible to leaching following the auto-clave sterilization process, the pores in MICRALOX® micro-crystalline aluminum oxide coating are completely stable, resulting in no contamination and color fading. In addition, MICRALOX® aluminum anodic coating has increased dielectric characteristics when compared to a hard coat anodizing of similar coating thickness – this results in the aluminum remaining further insulated from carrying an electrical current or charge – an important safety attribute for many electrical insulation applications. Also, as opposed to plastic and nylon coatings, MICRALOX® micro-crystalline aluminum oxide coating is formed to deliver consistent, uniform coating thickness tolerances across all dimensions of the aluminum part, thereby resulting in a highly engineered fit between components. Finally, MICRALOX® micro-crystalline aluminum anodic coating is fully RoHS compliant (unlike other corrosion inhibiting technologies based on heavy metals).